This type of mold is fairly safe and is generally not a big threat to humans. In some cases, Allergenic Molds may cause allergic reactions to those who already have asthma or allergies. It is uncommon for people to experience any serious reactions and in most cases if they do have allergic reactions it will be things like rashes, itchy throats, and nose/eye irritation. These molds are a bit more dangerous to humans. Pathogenic Molds are known to cause health issues to many people, usually either after physical contact or through respiratory infection. Despite being dangerous to many humans, most healthy people will not be in danger. If you any children, elderly people or sick people that have respiratory issues live in the mold infested area we highly recommend you keep them away from any mold. Pathogenic molds can be especially dangerous to them and can cause serious health problems. As you might have guessed Toxigenic Molds are the most dangerous, these molds are known to cause problems to both healthy and unhealthy people. 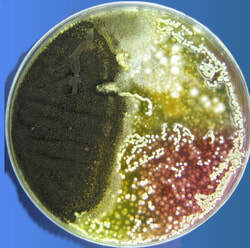 This mold is thankfully very rare but living with it can cause very many lifelong problems and we don’t recommend you try to do it, if you find out you have Toxigenic Molds in your home please do not stay in it, go to either a friends/family members house or hotel while you have a certified professionally team take care of it. There is no way of knowing the exact type of mold present without lab testing but out experts can often spot if mold is very dangerous or not. ​water damage restoration company. If water has managed to get into your walls you will often have mold problems. If you have recently had any trouble with water damage or suspect you might have mold we recommend calling (573) 746-1881 we are certified mold inspectors and will conduct a thorough mold inspection. Are generally in areas of high humidity or standing water, from faucets or drains leaking, appliances that may be leaking, (water heaters, dishwashers), exterior leaks from gutters, cracks or the soil higher than the wall. High humidity from a home closed up for a long period of non-use with temperatures that fluctuate causing humid conditions in the home. Items stored against walls, or damp items stored in closets will trap moisture and growth will begin within 48 hours. Problem: Moisture encourages biological allergens like mold and mildew. Remedy: Inspect for condensation on walls, standing water on the floor, or sewage leaks. To keep basement dry, prevent outside water from entering by installing roof gutters and downspouts, not watering close to the foundation, grading soil away from the home, and applying waterproofing sealant to basement interior walls. Problem: Biological pollutants can grow on water-damaged carpet. Remedy: Promptly clean and dry water-damaged carpet and non-hard surface furniture or remove it altogether. discard that to take chances with your health. Problem: Humidifier Moisture can encourage biological pollutants, including allergens such as mold and mildew. General maintenance can help catch potential concerns. Remedy: Check to be sure humidifier is operating properly. Furnace and ductwork kept clean to help with pollutants and air quality . Problem: This can be a source of biological allergens. source of moisture that needs repair before any cleanup is completed. The professional is lab trained and approved to sample air quality or direct sampling when required for health concerns. DNA sampling is a very specific testing and the inspector must be qualified to complete this type of test.